Cherries in Cognac and Kirschwasser: This seems like the winning combination. Simply delicious. The kirsch married with the fresh cherry flavor so naturally – which I guess shouldn’t be too much of a surprise. As with the cherries in rye, I strained the cherries out of the spirit, removed the orange peel and ran the spirit through a coffee filter to remove any cloudiness. I thought “maybe a little bit sweeter” so added in a some sugar, just a 1/4 cup, and then put everything back together again. Did it really need more sugar? Maybe not. I’ll see what happens and let you know. My first two pounds were stoned and converted into filling for some tarts. After gorging myself these, I decided I had to try my hand at cocktail cherries (the de rigueur garnish for my favorite cocktail, The Manhattan). I had already collected the stones from the ones I pitted for the tart filling and put them into a jar with some Thomas Handy rye. I was vaguely thinking this would form the basis for some bitters this fall. I had brandied some Bing cherries last year using a recipe from The New York Times but wasn’t so impressed with the results. I was looking for something different. After a bit of quick research on the web, I decided just to wing it and put up two batches: one in a 50/50 mixture of kirsch and cognac (ala griottines) and one in rye (Rittenhouse 100). Keep it simple, let the cherries sing. Pretty good looking, eh? I’m not 100% sure at what point to declare these things “done” so I’m going to sample ’em every five days or so and keep some notes. I’ll report back later and let you know what I find out. In which the author shares his recipe for black cherry balsamic shrub and a couple of cocktails which use it. The two shrubs (raspberry/blackberry and black cherry) which I wrote about on the 16th of May are now bottled. A number of very yummy cocktails have been created, made and savored. Shrub turns out to be a very intense ingredient which concentrates the flavor of the underlying fruit with sweet and acid notes. It obviates the need to add any citrus to a cocktail and adds no additional alcohol (a good or a bad thing depending on your taste). It seems most natural to make sweet/sour type drinks with this though one could experiment with dialing the amount of shrub back to see what happens (e.g. a gin-based drink using no more than 1/4 oz. of shrub). Below is my recipe for the black cherry balsamic shrub, which I feel is the more complex and unusual of the two I made, followed by a couple of original cocktail recipes which use it. I also should mention that I did make Jamie Boudreau’s “Clarke’s Conundum” using my berry shrub. It was in fact the first thing I tried. It was delicious and I’d make it again. Of course I am also thinking of ways I’d tinker with it. Perhaps using an Oloroso in place of the PX to make it less sweet and a bit more nutty? Hmmm. – I was out of white sugar when I made my shrub so used turbinado (AKA demerara) sugar instead. You may use either though I think the less-refined sugar will result a deeper more complex flavor. – I recommend buying a better grade of balsamic – i.e. not the cheapest you can find – but certainly not the most expensive. – You don’t want to use coarse ground pepper for this, which will give too much surface area and possibly become too dominant a flavor. I started with whole peppercorns which I then gently cracked in a small mortar and pestle. A scale for measuring ingredients in grams. A 1-liter wide-mouthed glass jar with a well-fitting resealable lid. A muddler or similar implement for smashing and pressing fruit. A fine-mesh sieve or even a chinois. A large mixing bowl made of glass or stainless-steel (i.e. non-reactive). Bottles for storing finished product. 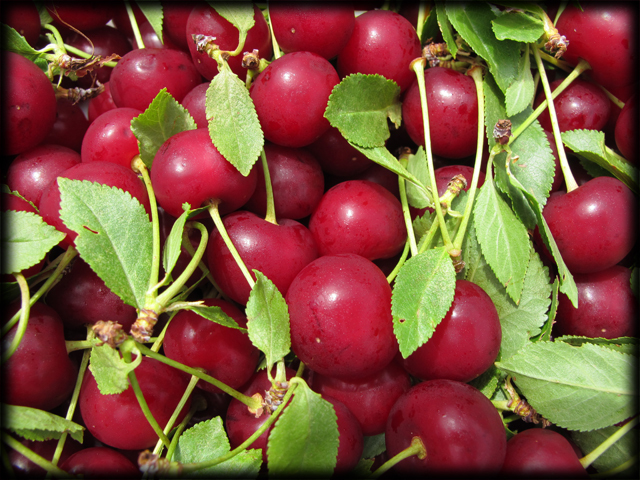 1- Wash and remove the stems from the cherries. 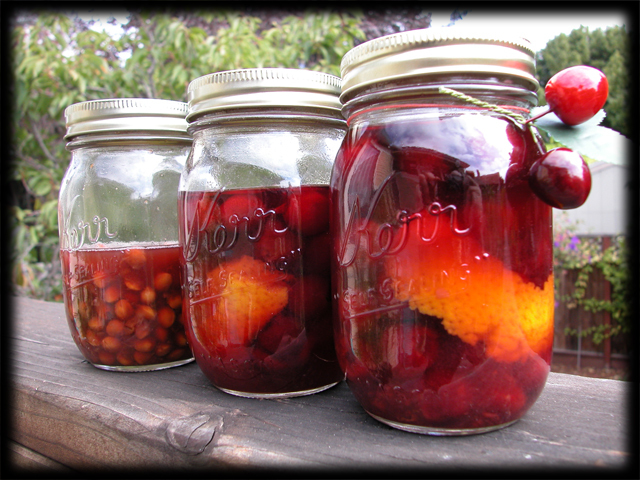 2- Put the cherries into the wide mouthed glass jar (“jar”). 3- Put the sugar into the jar. 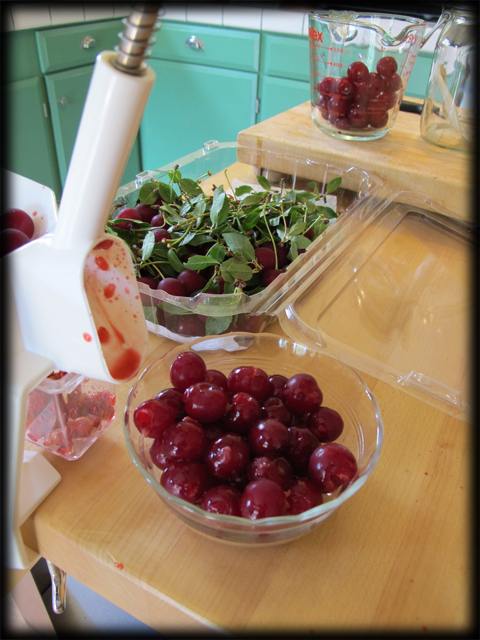 4- Use muddler to crush up the cherries, releasing juice, mixing things up with the sugar. Be sure that every cherry has been broken open. 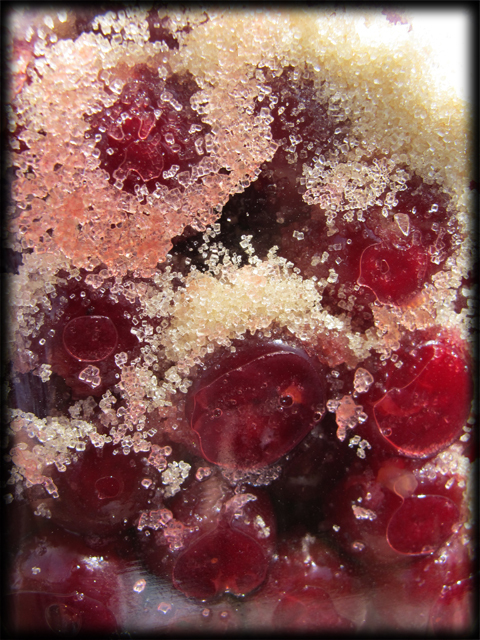 5- Stir the cherry-sugar mixture together until all of the sugar has been moistened by the cherry juice. 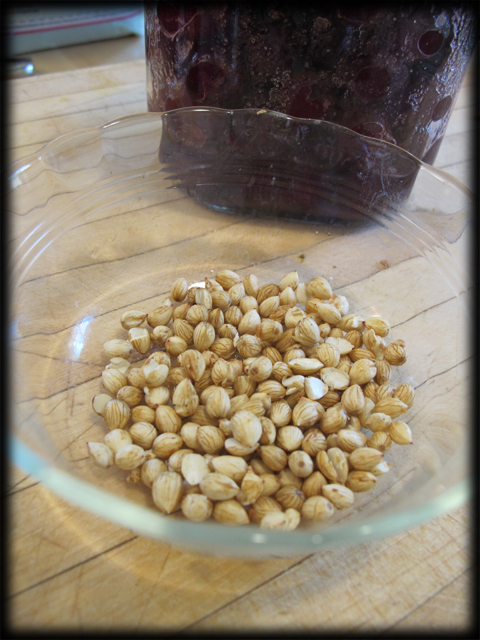 6- Seal the jar and let sit in a cool place to macerate for at least 24 and up to 48 hours. I recommend you visually monitor the mixture during this time for signs of fermentation. If it looks like it’s starting to ferment you may add up to 125 grams (one half) of the cider vinegar to arrest this process. NOTE: some slight froth is normal and does not indicate fermentation. That would be indicated by observing the formation and rise of small bubbles and the build up of CO2 gas in the jar. Also a little fermentation isn’t a bad thing but you don’t want it to get out of control as you are not making wine. 7- After maceration is complete, add the cider vinegar (or what remains of it), the balsamic vinegar, the cinnamon quills and the cracked black peppercorns to the jar, seal and shake well. Store in a cool place for at least 7 and as long as 10 days. NOTE: over the next day or so you should aim to get all the remaining sugar crystals dissolved by shaking a few times a day. This also helps you to form a bond with your new shrub. 8- When you are ready, strain the contents of the jar into a sufficiently large non-reactive bowl. 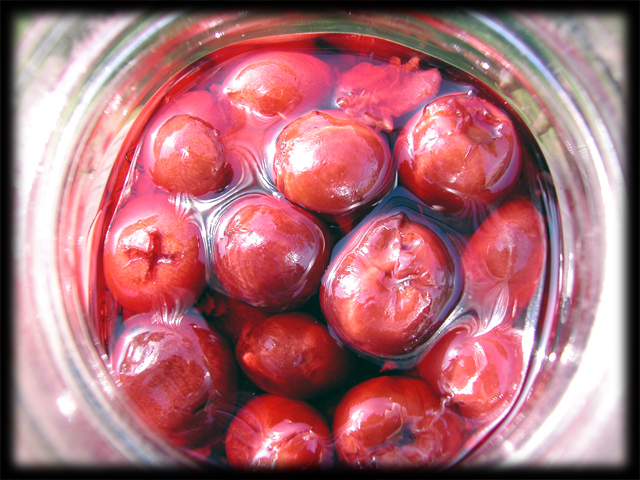 Use your muddler or the back of a large spoon to press as much liquid as possible from what remains of he cherries. Get as much a possible out before you give up on ’em. 9- Set up your funnel with a couple of layers of cheesecloth and pour (or ladle) the shrubb into your bottle (or bottles) for storage. NOTE: the cheesecloth will still let a lot of very fine fruit particles pass. I think there’s a lot of flavor in them particles so this doesn’t bother me. As the shrub stands, these particles will settle out so I give my shrub a good shake before using it for a cocktail. I suppose it could be decanted – and maybe I’ll try that at some point to see how it affects the flavor. I’ll let you know. 10- You are done. Clean up and get ready to make some cocktails. Stir ingredients over ice. Fine strain into a chilled cocktail glass. Garnish with a long lemon twist. I was thinking about this one the whole time I was waiting for the shrub to be ready. It seems like a natural fit between the smokiness of the mezcal, the tartness of the vinegar and the sweetness of the cherries, complemented by a little chocolate from the Tia Maria. (*) – I actually tried my nascent chocolate orange bitters. If you are lucky enough to have access to Bittermen’s Xocolatl Mole Bitters bitters (soon to be available to the rest of us) you could give those a whirl. Stir ingredients over ice. Fine strain into a chilled cocktail glass. No garnish required.